I am so delighted to be able to invite you to my third yearly Print Workshop and Nature retreat on the islands where I was born, – the Åland Islands in Scandinavia. Join us for this very special opportunity . I grew up in this archipelago, and to this I return every summer. Being there makes me peaceful and very, very happy This is also where I recharge and find inspiration for most of my organic designs, patterns and motifs. 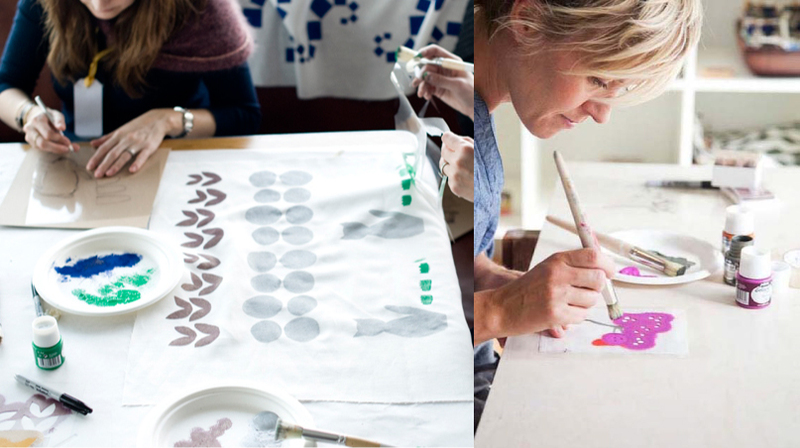 The Print Workshop Retreat will include four- half day workshops with me in the barn where we gather inspiration and motifs from the beautiful, natural surroundings and then translate them into patterns and motifs that we print on paper and textiles. We will together explore three different simple printing techniques and create lovely items and memories on paper and fabric to take home and cherish. I will supply you with all materials and tools that you need, and absolutely no art or design background is required, just a willingness to explore and play. Create, explore, swim in the brackish ocean, take saunas under the midnight sun, hike, kayak, make lovely things with your hands, make new lovely and interesting friends and simply ‘be’ in this rather special and gorgeous part of the world. We will also enjoy incredible meals that are prepared daily by the most talented and passionate chef Viktor, and his brother Gustav. Our private chefs only use fresh and local, and mostly organic ingredients, often grown on the little farm on Silverskär, and fish is caught by hand in the ocean that surrounds us, berries and mushrooms harvested by locals and neighbours. Silverskär is truly a magical place: it is a completely private 40-acre island in the Åland archipelago. Silverskär used to be a working farm with cows and pigs, and has been fully converted to a unique and comfortable homestay, with the old barn and the main house, and some charming cottages where you can immerse yourself in this very rare and special setting! So why don’t you join me on this amazing trip… imagine: a whole private island just for ourselves, days filled with inspiration, nature and crazy delicious, wholesome meals. Registration will open for this amazing & simply luxurious experience in November 17, 2016, 12pm EST. A few more days and soon the Holidays are here. I look forward to it this year: the gravlax my dad taught me how to make, the yearly viewing of Ivanhoe with Anthony Andrews (LOVE IT, so much, since I was 10! ), spending whole days in pj's and very slow days with my boys here at home, among many other things. I wanted to suggest a powerful last minute Holiday Gift: One of my workshops I am teaching in 2016. I usually have the most fun and creative students in these classes, who create the most lovely prints and designs. Together we explore, talk about inspiration, print, reminisce on good music, chew on small business challenges, share contacts and laughs. Together we create connections and memories that last for a long time. I truly do not not know a better gift than that (to others or myself for that matter)! Workshops in my Brooklyn Studio are already all sold out, but I will be teaching in so many other amazing places next year. Åland: I go back home every summer, for a long time. I was born here and need to go back every year to get my calm, connect with family, swim in the brackish waters, eat smoked fish and take saunas at midnight, - and to draw. Join me on our own private island with our own private chef who will cook us amazing meals morning to night. We print and create in the barn, dance and swim under the midnight sun. A truly magical and special experience, that will last you a life time. July 2016. Learn more here. 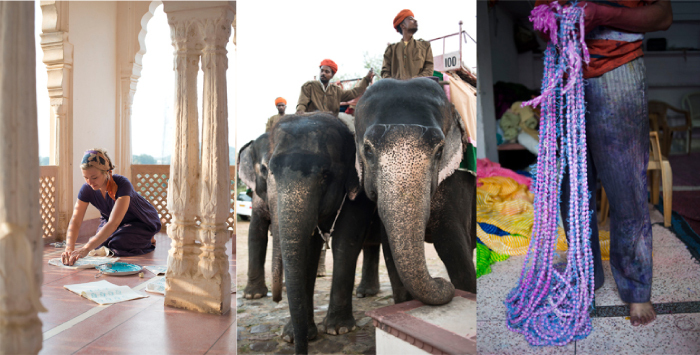 India: I am going back to Jaipur together with Ace Camps for a truly wonderful journey. We visit so many interesting artisans and craftsmen that have printed and dyed textiles for several generations. Take all that inspiration and then print with me! Incredibly fun, all of it! Learn more here. Los Angeles: Finally I get to go back to Los Angeles. I used to live in California and I miss that special light, the palm trees..and yeah..LA is awesome to visit. Can't wait. I team up with old friends from my trade show days, Poketo. These workshops take place at the splendid and cool Line Hotel in Koreatown. A few spots left. February 2016. Sign up here. Denver: So thrilled to be invited by Fancy Tiger Crafts to teach in their creative place. These ladies are so fun and rather talented. Cannot wait to visit Denver for the first time in my life and I cannot wait to meet you there for some April 2016. Sign up for your spot here. I am really hoping to come to Amsterdam and London in March 2016 for some "workshopping" (and other shopping). I will keep you posted on that as soon as I know more. And: if you want some temporary bling bling for all those holiday and new years parties, may I recommend my Brilliant Bracelet Set that I created with Tattly! Supa fun! 2016 is going to ROCK...NEW projects, BIG changes and 20-year celebrations-more about that after that needed Holiday break . I am very proud and happy to introduce to you my 3rd sewing book, Lotta Jansdotter Everyday Style. This time I am showing you how make your own stylish, cute, functional and everyday garments. The book is filled with really simple patterns and interesting clothes, which are all modeled by real people. Most of you probably know me as a different kind of designer (for those of you not so familiar with my work, I create surface patterns and designs that are printed on all kinds of things: fabrics, rugs, cushions, paper goods and plates, to name a few), and the truth is that I do not really know how to sew that well! The very simple and basic sewing I do know is from home economics class in elementary school! I remember so strongly how satisfying and EXCITING it was to sew a pair of my own PJ pants; it was such a wonderful feeling to make a something that I could wear. I still carry that feeling and wanted to share the excitement at making your own garments in fabrics of your own choosing in this book. Since I don't know how to create sewing patterns, I invited pattern maker Alexia Abegg to collaborate with me. She drafted all the patterns in sizes XS to XL based on my ideas, vision, and style, which is rather non fussy - simple lines and classic cuts, cute and functional everyday clothes. Now I can start learning to sew again! Since this book is focused on easy patterns it won’t intimidate a novice sewer. I hope you will feel as tickled as I am by these projects. I also hope you will feel inspired to add, alter, and change things to make them more YOU by picking your favorite fabrics, adding ribbon, pockets, lengths, lining, prints, and swatches for example. I have worked with some really special models for this book. I invited some friends and relatives of all ages to take part, and I could not be happier that they are part of this project. The amazing photographer of this book is Jenny Hallengren - she is also one of my best friends, since I was 10 years old. She has worked tirelessly with me, and together we have had some rather wonderful adventures while making this book. To celebrate the release of Lotta Jansdotter Everyday Style, STC Craft have invite many talented and creative bloggers and makers on a Blog Tour that starts today! For almost every day in December we will see different versions of projects sewn out of the book. There will also be give-aways on each blog - not only of the book, but also some Lotta Jansdotter fabrics that were created together with Windham Fabrics, and temporary tattoos made together with Tattly - it is like an advent calendar of sorts, a gift everyday until Christmas! I CANNOT WAIT! It is so super exciting for me. Wow, now lets see what YOU will make! I would of course love it if you want to share with me your process and your finished projects on Instagram: @lottajansdotter Use the tag #lottaeverydaystyle so we can find them! Lotta recently met with the ladies of Madesmith for the first time. To learn what she is most excited about next year, follow this link! Listen to a Lotta Jansdotter podcast! I recently chatted with Stephanie from Sewciety about all things textiles! Listen in here to learn how I got started and what keeps me going. We also talk about my newest fabric collection called Follie which will be available in stores mid-November. It’s a really good Friday morning here in my Brooklyn studio. I have been back in my studio for a few weeks now, settled in again. Every summer I pack up lots of stuff and my 7-year old kid for my yearly summer sabbatical back home to Scandilands. We run barefoot most of the time, but swim more than we run actually, and unplug from most media for weeks. We are now recharged and thrilled to immerse ourselves in this crazy town Brooklyn again. I have started taking ukulele classes (which is very hard it turns out) and I am back to the ceramic studio again which I have missed greatly. Talking about learning new things, and making things with your hands: I am so stoked to be traveling to many cool places in the next year; learning new crafts and teaching color and design (together with you?) -weaving in Oaxaca, Mexico in February, batiking in South Africa in April and how about a creative nature retreat on Åland in July? "My" island where I was born and where so much of my inspiration comes from, a place to really immerse myself in nature and breathe... and draw. I am also going to Tokyo this December to teach three workshops ... whoop whoop! Please find more information about these workshops on our website. And yes - two workshops in my Brooklyn studio this fall. You can sign up here. My latest fabric collection "Follie" is now available for stores to order. You will find all the fabrics in your local fabric shop in November. Visit Windham's site to learn more on how to order yours. I am delighted to be working with Rizzoli now. I have created a 2015 wall calendar for them, that you can buy here. And our popular hand printed fabric calendar that I make every year for the past 15 years now is on the way to the studio soon...it is just a matter of days now… stay put. Did you know that I have a whole collection of porcelain? It includes bowls, plates and mugs with my signature patterns and motifs, available in different colors. Find them here. I will be part of Gowanus Open Studios 18 &19 October. It is a super fun event; I love peeking into creative spaces and seeing processes, discovering new art and design. Please come to my studio and see what I am working on. I will take the opportunity to have a super mega blow out SALE that weekend too. I've simply got to do some fall cleaning of a gazillion, fun and creative things that have piled up the past 2 years. Learn more about it here. Now I am going to delve back into my book project… my deadline is coming up rather soon. I am thrilled to be working with Melanie Falick and Abrams this time and this new book will be in stores Fall 2015. By the way, "Are you going to be my girl” by Jet is a super cool and fun ditty that started my day off on the right track. So... talk to you soon and as always don't hesitate to connect. We would love to hear from you! Hi there, I'm Madi, the intern at Lotta Jansdotter's studio. I'm from St. Louis, where I've been finishing up my degree in graphic design. Last summer, I took one of Lotta's printmaking workshops, and I loved it so much that I decided to spend my final semester living in Brooklyn to work with Lotta. It has been inspiring to follow along with her creative process. Textiles and surface pattern design are my passion, and this has been a great way to get an inside look at how the industry operates. I've been here for about two months already and have had so much fun spending time in the workspace and exploring Brooklyn. Here are a few photos we've taken around the studio! I have an extensive washi tape collection at home, and I love these tapes with Lotta's designs. Cutting fabric in preparation for an upcoming book project. My dream job! 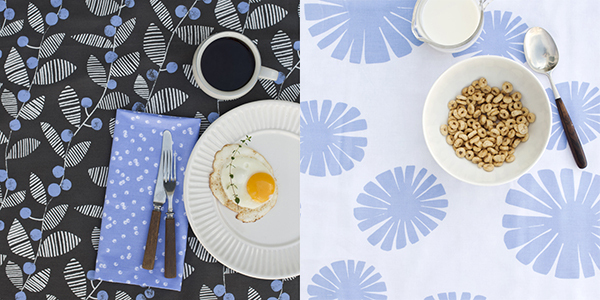 Lotta just released two beautiful fabric collections—Mormor and Sylvia. Sorting samples from Lotta's newly-released rug line. Click here to learn more about the rug collection with Surya. Most of these photos are from Lotta's or my Instagram accounts. We love Instagram! You can tag along on my Brooklyn adventures at @madmadi1210 and get a behind-the-scenes look at day-to-day happenings with Lotta at @lottajansdotter. Thanks for reading! 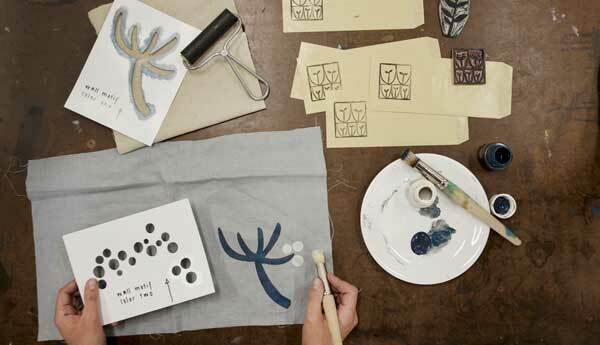 Sign Up for Our Spring Printmaking Workshops With Lotta! We are so happy to announce our Spring and Summer 2014 workshops at the beautiful Lotta Jansdotter Brooklyn studio! During the Surface Printing Workshop, participants will learn from Lotta on finding creative inspiration in everyday life, and turning those ideas into prints on different materials. Printmakers and creatives of all levels and experience are welcome to our intimate 4-hour workshops. All supplies, including Lotta's printing kit, and some delicious local nibbles are included in the cost. Participants will come away with several finished projects and loads of inspiration for future printmaking on their own. Meet Lotta at the AmericasMart Atlanta Trade Show! Lotta is jetting off to Atlanta today for the AmericasMart Atlanta trade show today and is very excited to meet you and introduce two new collections with Surya and C.R. Gibson! On January 8, from 2-3 p.m. at the Surya showroom, Lotta will be talking about the creative process behind her pillow and rug collection. Afterwards, there will be a Q&A session and meet & greet at the Surya Showroom 11-A-1. On Thursday, January 9, join Lotta in celebrating the launch of her stationery and gift collection with C.R. Gibson. They will host a Swedish "fika" with coffee and treats (and a free gift!) from 4-5 p.m. in building 2, suite 1837. We hope to see you in Atlanta, starting tomorrow! If you can't make it to the show, but are interested in Lotta Jansdotter products, please contact questions@jansdotter.com to receive current wholesale information. I am thrilled to be launching a collection of bespoke wedding stationery in collaboration with my good friend Breck of Sesame Letterpress. In the past, I have created a handful of custom wedding invitations for special friends but have never taken the leap to offer wedding stationery officially to everyone, even though I have had many requests and much interest. With this collaboration, I am delighted to finally be able to introduce wedding stationery for your special day. Sesame Letterpress has more than a decade of expertise creating custom letterpress invitations out of their Brooklyn studio. As a boutique design shop, they can work closely with you to guide you through the process of creating invitations for your wedding. All of their printing is done on-site and all pieces are hand-fed into Victorian machines one at a time, resulting in the most exquisitely beautiful stationery. Their work has been featured in Martha Stewart Weddings, InStyle,Lucky, Brides and The Knot, to name just a few. To start my collaboration with Sesame Letterpress, I am offering a collection with some of my signature patterns and motifs. The beauty of letterpress printing is a great pairing with my illustrations and bright palette, and this stationery is perfect for a couple with a penchant for bold, modern designs. Even if you’re not in the market for wedding invitations, the thank you cards are perfect for any occasion. You can view the collection and learn more details here. One of our favorite things to do here in the studio is to organize — and reorganize! — our supplies, inspirational scraps and books. Keeping our space tidy is essential to our productivity, and the way we store things has become an integral part of how we decorate the studio. Lotta has collected storage containers, crates and flat files from around the world, and we're always looking for more ways to spice them up. While we were doing our fall cleanup this week, we found ourselves drawn back to this Sweet Paul feature from 2012. A little bit of stenciling can really brighten up a simple canvas box, don't you think? It's also a great technique for creating custom labels on your containers. Take a look below and see the full feature here.